The MIDI protocol, a method for communicating which notes various machines should play and how they should play them, emerged in 1983, which makes it relatively ancient computing technology by most standards. Nonetheless, MIDI remains a crucial way to get various electronic instruments to talk to each other — even iOS devices like the Apple iPhone, iPod Touch, or iPad, and their sensitive tilt and velocity sensors. This new version of the app allows you to use your iOS device to control MIDI control channels (which can be assigned to synth parameters and FX) through movement. By assigning a MIDI control channel to the X and Y axes and using the devices accelerometer you can manipulate sound through movement like never before — and whilst still using SoundPrism Pro’s innovative touch interface to play multiple MIDI channels, as demonstrated in [the above] video. 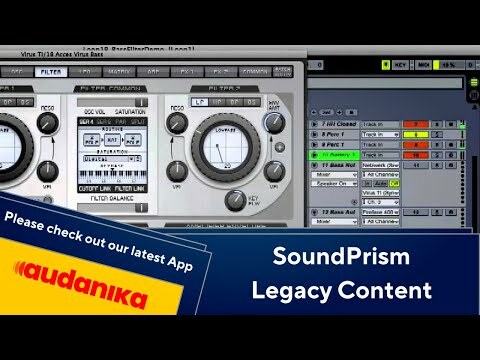 The latest update also enables velocity, which opens up a new level of expression and realism to playing synths and VST instruments with SoundPrism Pro. Velocity sensitivity can also be set within the apps options, allowing the user to a good level of control over this feature. This lies beyond the capabilities of the average music fan, but the combination of MIDI, apps, and accelerometers is already enabling the creation of invisible instruments and other ready-for-primetime creations. When that happens, remember: Shake it but don’t break it!